The catacombs in Rome contain many frescos telling us what those Christians living between c.100–c.350 AD believed, how they lived out that faith and what things were most important to their faith. 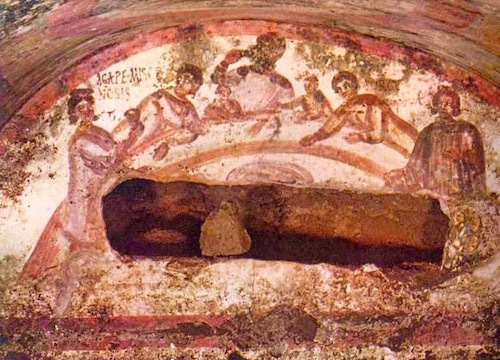 The Fractio Panis (Latin meaning “Breaking of Bread”) fresco in the Catacomb of Priscilla on the Via Salaria is liturgically and theologically one of the most famous of catacomb paintings because it gives an idea of how they took Communion, the Eucharist. Seven people, one of whom is a woman, are reclined/seated at a table where there is a cup of mingled red wine and two large plates. One plate contains five loaves of bread, the other two fish, replicating the numbers in the multiplication miracle from the Gospels. 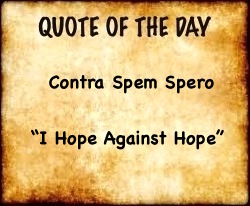 A man (presbyter/priest?) at the left end of the table has a small loaf in his hands. His arms are stretched out in front of him to show he is breaking the bread as Jesus broke the bread at the Last Supper and before He fed the five thousand and the four thousand. Near the man is a two-handled cup. 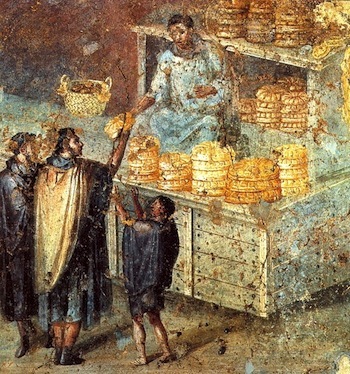 On one side of the painting are four wicker baskets overflowing with bread. On the other side there are three baskets filled with bread representing the “seven basketfuls of broken pieces that were left over” (Mt. 15:37) after Jesus had fed the four thousand. 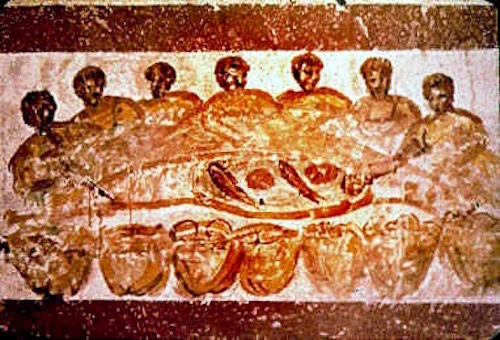 The Fractio Panis fresco illuminates more clearly how the early catacomb Christians celebrated the Lord’s Supper. We see the Eucharist bread is broken and blessed by the laying on of hands. A cup of wine is present as are two fish. All three elements are on the table. 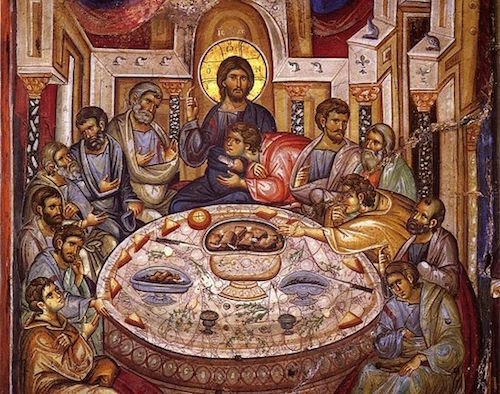 Two millennia later Christian Communion is exclusively celebrated (Latin celebrare meaning “to assemble to honor”) as reflecting the Last Supper when Jesus pronounced the Bread His Body and the Wine His Blood. According to their iconography, the catacomb Christians gave the Eucharist a much broader context by including fish in the ritual. There is a very early description of the correct way to celebrate the Eucharist (meaning in Greek “thanksgiving”) in the Didache, a work cited by the Christian writers Clement of Alexandria (c. 150-215), Eusebius of Caesarea (263-339) and Athanasius (c. 293-373). 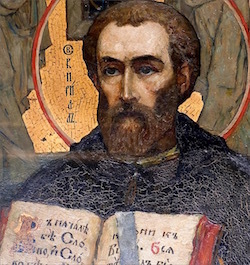 Though known through those authors, the Didache in manuscript form had been lost for over 1,400 years until it was re-discovered in 1873 by a Greek Orthodox Metropolitan, Philotheos Bryennios, in the Jerusalem Monastery of the Most Holy Sepulcher in Istanbul. 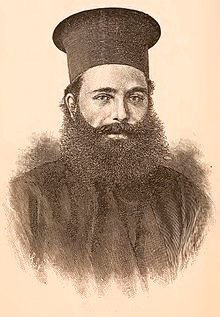 Bryennios published the Didache in 1883. It was immediately recognized as one of the most important manuscripts (Latin manu meaning “by hand” and scriptus meaning “written”) of the Early Church because it was obviously written before church hierarchy was firmly in place and was very close to the Jewish Apostolic Age. 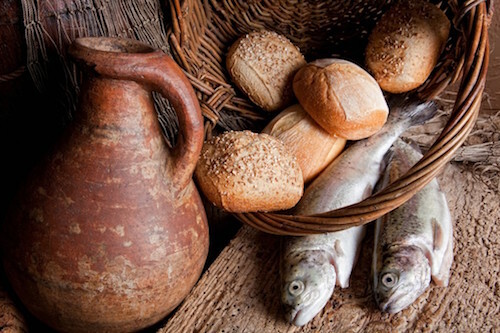 And with respect to the fragment of bread: ‘We give you thanks, our Father, for the life and knowledge that you made known to us through Jesus your child. To you be the glory forever. And when you have had enough to eat, you shall give thanks as follows: ‘We give you thanks, holy Father, for your holy name which you have made reside in our hearts, and for the knowledge, faith and immortality that you made known to us through Jesus your child. To you be the glory forever. You, O Master Almighty, created all things for the sake of your name, and gave both food and drink to humans for their refreshment, that they might give you thanks. And you graciously provided us with spiritual food and drink and eternal life through your child. Above all we thank you because you are powerful. To you be the glory forever. Remember your church, O Lord; save it from all evil, and perfect it in your love. And gather it from the four winds into your kingdom, which you prepared for it. For yours is the power and the glory forever. 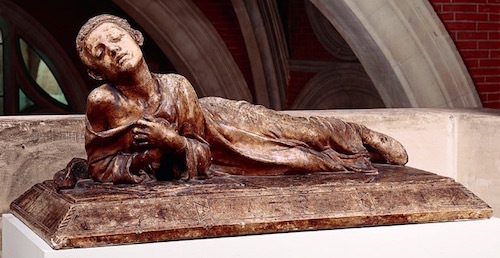 The holy boy, Tarcisius, is called “the Eucharist martyr.” He was beaten to death rather than let the Communion bread fall on the ground. He is buried in the Catacomb of Callixtus where the poem of Damasus honors his sacrifice.